View from my new home in Plymouth, New Hampshire. As the Rent musical soundtrack reminds us, each year has 525,600 minutes - but is this the best way to measure a year in a life? I've had many daylights, sunsets, and cups of coffee, as the song continues on. Just check out the photo above, which was taken from my own backyard! But the defining feature of the past 365 days has been my new role as a Program Coordinator and Assistant Professor of Art History in New Hampshire. There are many ways to measure my time at my new home: in classes, in faculty meetings, in office hours, in field trips, in outdoor adventures. This post is my best attempt to fill in what I've been up to over the past year - if not quantitatively, then qualitatively. An interactive panel discussion with PSU Art Faculty. Featuring Nick Sevigney, Phil Lonergan and his daughter Ruby, Kristin Horan, Jay Moskowitz, and moderated by Sarah Parrish. Held in conjunction with the Museum of the White Mountains’ exhibition, Sources of Inspiration: Friends, Family, Connections. I could not have asked for a warmer welcome when I arrived on campus last fall. In particular, The Museum of the White Mountains invited me to participate in their programs in an integral way. I was honored to showcase my scholarship on contemporary craft as part of their autumn Members Only event, and I also moderated two "ArTalk" panels in conjunction with the faculty exhibition. Speaking with my studio art colleagues about their work was a great way to get to know them better, and the dialogue generated fresh insights about our respective practices. Jeffrey De Blois’ lecture at the Museum of the White Mountains, Uploaded by Plymouth State University on 2018-03-19. In the spring, I teamed up with the Museum of the White Mountains again to bring alumnus Jeffrey DeBlois to campus to speak about his role as Assistant Curator at the Institute of Contemporary Art. Specifically, he discussed his supporting role on the exhibition Art in the Age of the Internet, 1989 to Today. This interdisciplinary focus was a perfect fit for our program, which is housed not in a traditional department but in an Arts and Technologies "cluster." You can read about the event here or watch the video above. Textures and colors in Forms and Alterations at Boston University Art Galleries. While exciting things were taking place on campus, I also had the opportunity to steal away on several field trips. As the faculty advisor to the Student Exhibition Club, I chaperoned a trip to Montreal that the group co-sponsored with the Student Art Collective. In the spring, I packed up the giant rental vans again to take my Women, Art, and Society class (along with a few stowaways) to see some Boston exhibitions tackling issues of gender. Former Boston University classmate Sam Toabe gave us a tours of HARD: Subversive Representation at the University of Massachusetts Art Gallery, while Lynne Cooney provided an intimate view into Boston University’s Forms and Alterations, a show dealing with with identity and sexuality through artistic adaptations of clothing. Unlike blockbuster museum shows on elite designers like Alexander McQueen, Cooney considered how fashion can affect social change from the bottom up rather than the top down. BFA Seniors at the MFA. 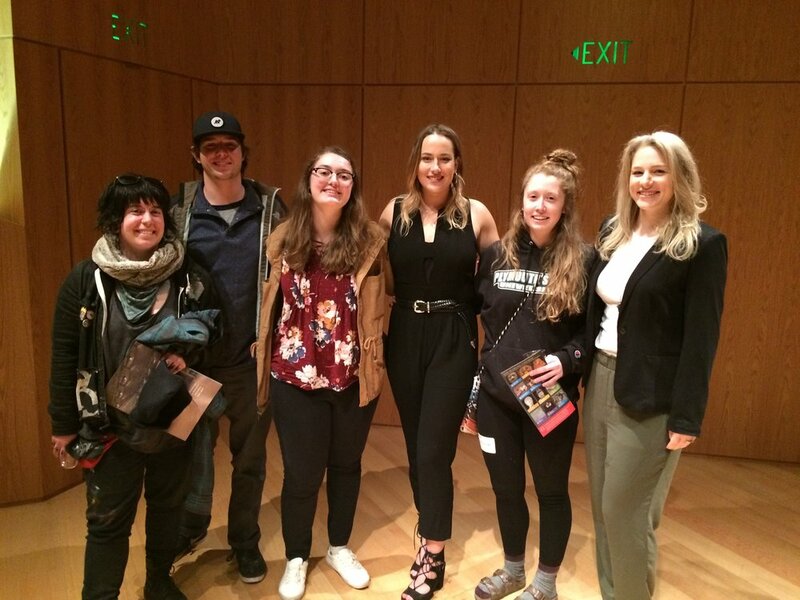 From left to right: Julie Mosso, Rob Hansen, Rae Bujeaud, Caity O’Leary, Felicia Wells, Sarah Parrish. Another very special occasion that took me back to Boston was the Visual Culture Consortium's Eleventh Annual Undergraduate Art History Symposium. Four of my students submitted competitive proposals, and BFA Senior Caity O'Leary (center) was selected to deliver her paper “The Macabre, Monsters, and Mankind: Francis Bacon’s Biomorphic Surrealism.” The fact that her entire BFA cohort bused down to see her speak is a testament to the supportive and caring student body that I get to work with everyday. Left: Installation view of Denis Mwaura, Being and Becoming. Right: Celebrating with the artist-curator at his Lavender Graduation ceremony. These seniors have accomplished so much, and they're only just getting started! Denis Mutungi is another senior I had the privilege of working closely with. You know the hip phrase "farm to table" restaurant? Well, Denis created a "studio to gallery" exhibition for his capstone Being and Becoming at our student-run Collins Gallery, pictured above. 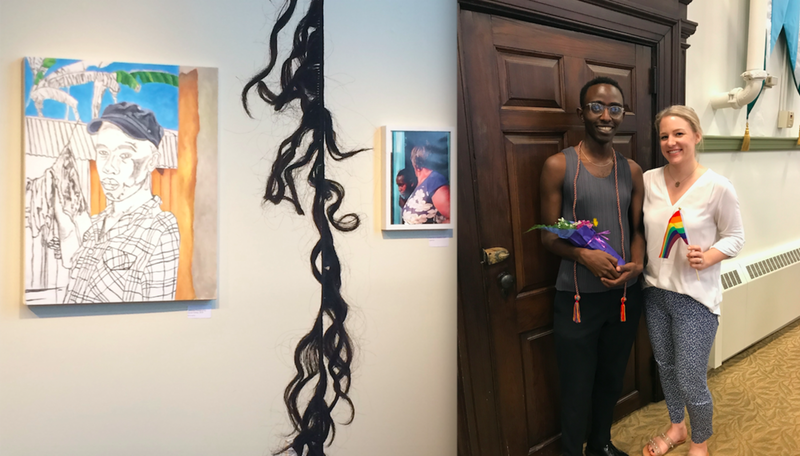 He won the Rainbow Tassel at PSU’s LGBTQ+ Lavender Graduation and it was an honor to celebrate his artistic advocacy with him at this special event. Hamming it up with the three other adjudicators at Conception Art’s summer even in Boston. Working predominantly with studio artists is a highlight of my teaching practice right now. It is rewarding to help them navigate conceptual issues in their artwork while pointing them towards established artists and theorists who can offer inspiration. So when Conception Arts asked me to judge their Boston pop-up event, I jumped at the opportunity to work with more emerging artists as they kick of their careers. As Spring Semester wore on, I felt rather hypocritical for asking my students to blog without modeling this behavior myself. So in the year to come, check back often to see how I'm spending the next 525,600 minutes of my life - or at least a couple of them.